The Middlebury College Community Chorus presents its annual Thanksgiving concerts on the Robison Concert Hall stage at the College’s Mahaney Center for the Arts at 7:00pm on Saturday evening, November 17 and at 3:00 pm on Sunday afternoon, November 18. 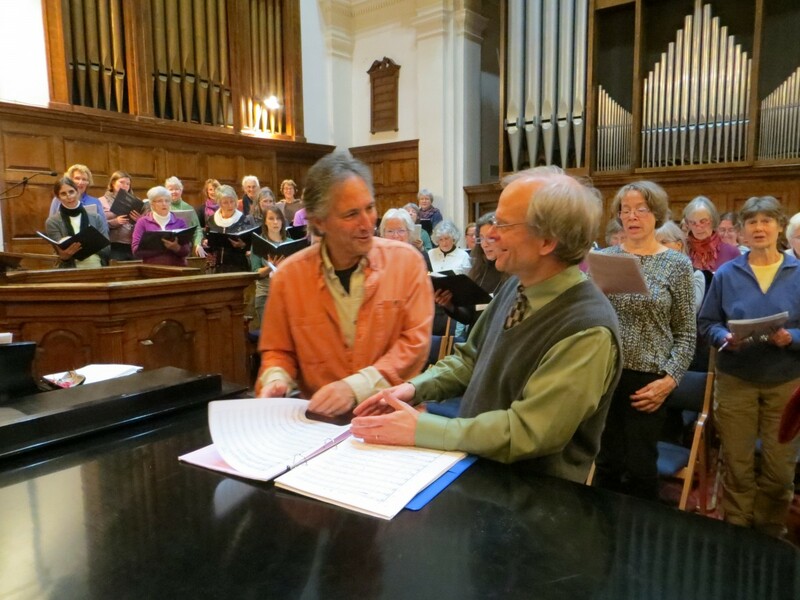 A varied selection of historic and contemporary music fill the free, hour-long program entitled “A Song Arising.” Jeff Rehbach conducts and Tim Guiles accompanies the nearly 100 community and student members of the choir – among the largest choirs in the state! The chorus conveys the presence and power of music through songs written by a new generation of composers. Their words convey ideas of “original harmony, sounding from all things old and all things young; music formed deep within human hearts; and the light of song that shines strong through darkness, pain, and strife.” We hear these words in Muusika by Estonian composer Pärt Uusberg; in Earth Song by Frank Ticheli; and in Dan Forrest’s sensitive setting of the poem Alway Something Sings by Ralph Waldo Emerson, that features Middlebury Union Middle School student Asa Baker-Rouse singing solo soprano. Songs of celebration and thanksgiving include I Will Sing, a toe-tapping gospel song by African-American composer Rosephanye Powell; Hymn for America by Stephen Paulus that portrays the beauty and blessings of our land; and an energetic setting by longtime Vermont resident Gwyneth Walker of a nineteenth-century hymn, How Can I Keep from Singing. The program features classical composer Wolfgang Amadeus Mozart’s earliest and final choral works, a setting of Kyrie Eleison, and the final movement of his splendid Requiem. We bridge these two selections with Illumination, a Latin text that originates from 17th century Ireland, set by Celtic composer Michael McGlynn. Instrumentalists from the Middlebury Community Music Center, Vermont Symphony and Champlain Philharmonic Orchestra accompany the choir for these selections. The concert will close with The Song Arising. Its vibrant words and music by Frank M. Martin ring out, “I will awaken the dawn, let there by singing, let there be music!” Come hear your neighbors from Brandon, Bridport, Bristol, Cornwall, East Middlebury, Goshen, Jerusalem, Leicester, Lincoln, Middlebury, Monkton, New Haven, North Ferrisburgh, Orwell, Ripton, Salisbury, Shoreham, South Burlington, Vergennes, Weybridge, Moriah NY, and students from Colorado, Indiana, Kentucky, Maine, Massachusetts, Virginia, Latvia, Zimbabwe, and China perform together. Contact director Jeff Rehbach, 989-7355, for more information. Note: These performances cap off a weekend of choral music, that begins on Friday evening in the Concert Hall at 7:30pm, when the Vermont Collegiate Choral Consortium performs “Missa Luba” for chorus and percussion, with words of the traditional Mass in a setting based on Congolese musical idioms, sung by the student choirs of Middlebury College, Castleton University, and Northern Vermont University. This entry was posted in Midd Blogosphere, music and tagged alum, choir, chorus, community chorus, concert, For Faculty, For Staff, Institutional News, Midd News & Events, Midd Points on November 5, 2018 by Jeffrey Rehbach. Attention Middlebury College Community! The time has come to begin collecting donations for the annual Winter Clothing Closet! It’s a winter clothing drive organized by International Student & Scholar Services (ISSS) to benefit new international and U.S. students (especially those who have never lived in a cold climate) who need warm winter clothes. We seek “like-new” or “gently-used” winter clothing. In particular, we’re looking for winter coats, jackets, hats, mittens/gloves, scarves, and footwear/boots in good condition that would appeal to college students. McCullough Student Center– by the Box Office. Service Building/ISSS Office– In the first floor entryway, by the stairs that go up to ISSS. We collect items from October 4-18, 2018. The Winter Clothing Closet will be on Friday, October 19, where items are given to students for free. Questions? Please contact ISSS at isss@middlebury.edu or by phone at 802-443-5858. Thank you in advance for your contributions, which will help many new students stay warm and cozy this winter. This entry was posted in Midd Blogosphere and tagged alum, For Faculty, For Staff, Midd News & Events, Midd Points on October 2, 2018 by Loren Scott. The Friends of International Students (FIS) host program recruiting and matching process for the recently admitted Class of 2021 has begun! The Class of 2021 will include more than 70 international students, including some U.S. students who have lived abroad and international exchange students. Please contact us if you are interested in hosting in the fall and spread the word in our community. International Student & Scholar Services will hold a series of information meetings about the program throughout the summer on the 2nd floor of the Service Building. We ask that new hosts attend a meeting so that we can meet them and share more information about the program. If you are an experienced host, you are welcome to join us as your stories and insights are vital to friends who are new to FIS and trying to decide if they would be a good fit for the program. Wednesday, June 21 12:30-1:30 p.m.
Thursday, July 27 12:30-1:30 p.m.
Tuesday, August 1 5:15-6:15 p.m.
Tuesday, August 22 12:30-1:30 p.m.
Wednesday, Sept 13 5:15-6:15 p.m.
To register for a meeting, please email ISSS at isss@middlebury.edu (subject line: FIS Host Program) or call us at 802.443.5858. Feel free to bring your lunch to our afternoon meetings. You can learn more about the FIS Host Program on our website at: http://www.middlebury.edu/international/isss/fis . Please share this information with friends and family who do not work at the College. We invite all who are interested to become a part of this wonderful program! This entry was posted in Midd Blogosphere and tagged alum, For Faculty, For Staff, Midd News & Events, Midd Points on July 3, 2017 by Carolyn Dahm. Tuesday, Aug. 22 12:30-1:30 p.m. This entry was posted in Midd Blogosphere and tagged alum, For Faculty, For Staff, Midd News & Events, Midd Points on June 26, 2017 by Carolyn Dahm. This entry was posted in Midd Blogosphere and tagged alum, For Faculty, For Staff, Midd News & Events, Midd Points on June 20, 2017 by Carolyn Dahm. Wednesday, July 27, 5:30 – 7:00 P.M. Brief remarks from the artist and curators at 6:00 P.M. Please join us for a reception marking the opening of the exhibition Landscaped, featuring the work of local photographer Timothy Case. The photographs on view present a variety of landscapes from around the country that are attuned to the effects of human interaction with the natural world. Six Middlebury College students curated and installed this exhibition as the culmination of the MuseumWorks 2016 summer internship program. Sponsored by the Middlebury College Museum of Art, the Center for Careers and Internships, and the Center Gallery Student Curator Fund. Refreshments will be served. Free and open to the public. Landscaped will be on view during normal McCullough Student Center hours until October 2016. This entry was posted in Midd Blogosphere and tagged alum, For Faculty, For Staff, Middlebury, MiddPoints, student life on July 25, 2016 by Jason Vrooman. 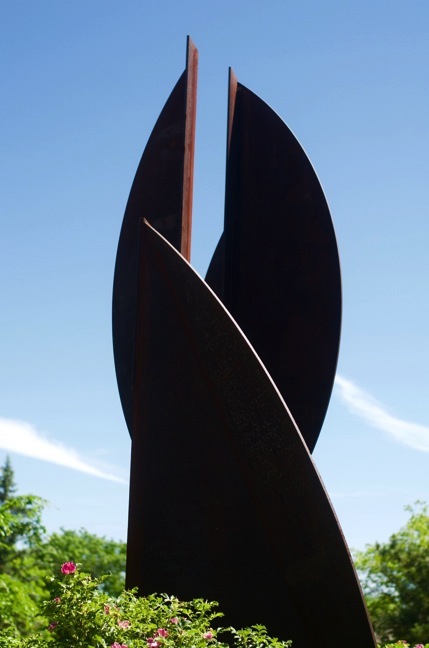 Detail of J. Pindyck Miller ’60, Youbie Obie, 1972-75, 1985, Corten steel. Photo by Matt Gillis ’18. Come enjoy Middlebury’s beautiful campus and its incredible collection of public art. On this walking tour, Middlebury College Museum of Art summer interns Claire Borre ’18 and Matt Gillis ’18 introduce highlights from the College’s large and distinguished collection of outdoor sculpture. Tour departs from the Middlebury College Museum of Art in the Mahaney Center for the Arts and continues across campus, ending at Bicentennial Hall. Rain or shine. Free. This entry was posted in Midd Blogosphere and tagged alum, exhibits, For Faculty, For Staff, Middlebury, MiddPoints, student life on June 30, 2016 by Jason Vrooman.